On Thursday, HP announced 13 new printers and scanners, many of which target the small and midsize business market. 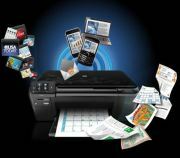 This new range of printers and scanners emphasizes Web-connected printing and advanced scanning. HP's TopShot Laserjet Pro M275 can scan 3D objects. A new scanning technology, HP TopShot Scanning, captures six images of a document or 3D object and combines them to create one high-quality image suitable for print or Web. The first printer with this technology, the HP TopShot Laserjet Pro M275, is "coming soon" for $349. The new HP Officejet Pro 8600 e-All-in-One series and the HP Officejet Pro ePrinter are meant to offer professional quality color documents at a 50 percent lower cost per page than laser printers. These inkjet printers are also equipped with ePrint, which lets you print from mobile devices by sending an email to the printer. The 8600 All-in-One series will start at $199. Two of the current Officejet models made PCWorld's "Top 5" inkjets list. ePrint is also getting better with Wireless Direct. Now you'll be able to connect to a printer from a mobile device directly over peer-to-peer Wi-Fi, without having to go through the Internet. Mobile ePrint Home and Biz apps are available for Apple iOS, Android, and Symbian smartphones and tablets. The ePrint Mobile Driver for PCs is supposed to make it easy to send a document to a registered ePrint device with a “File and Print” option. And the ePrint app for BlackBerry is getting options to print to ePrint-enabled service providers, HP Enterprise service providers, and HP Public Print services providers. On the scanning side, the HP Printer Control mobile app for iOS devices can take scans from an ePrint-enabled multifunction printer and upload them to Facebook or Google Docs, or let you scan them to an email. 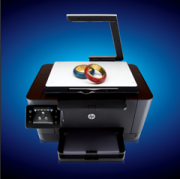 In addition, HP announced new Print apps aimed at business. Print apps are designed to give you access to pre-formatted content you can either download directly to your printer and print without the need for a computer, or scan directly to Internet storage. The new HP Business Apps includes Stamps.com Web postage, apps from Shoeboxed for scanning business cards and receipts, as well as apps from Google Docs and Box.net. Many enterprise-level technologies are now being made available to SMBs via HP’s recent acquisition of Printelligent. HP will begin rolling out its HP Partner Managed Print Services over the next year. HP is also offering a Smart Marketing Suite to address inefficiencies in marketing. It consists of software and services, developed with Omnicom Group, that optimize and automate marketing workflows.